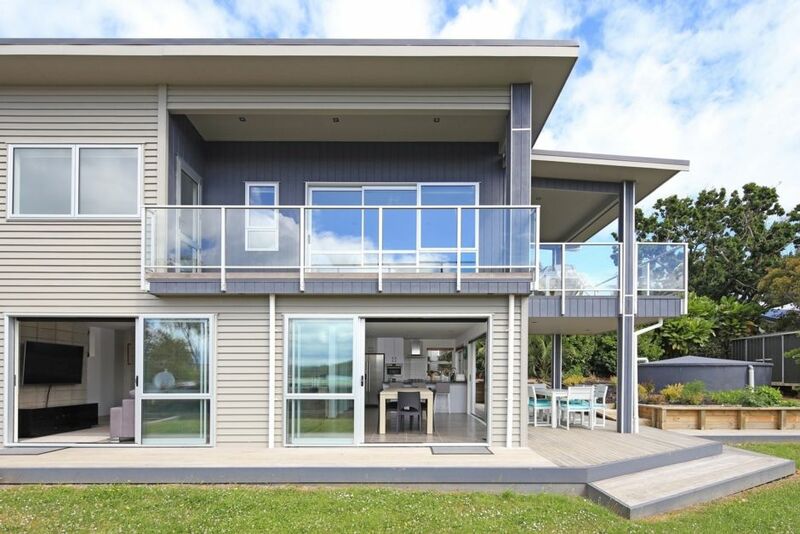 Only 5 minutes from the Matiatia ferry terminal, walking distance to the heart and soul of the Island - Oneroa Beach and Oneroa Shopping Village. This stunning statement home comes complete with top of the range appliances, three beautifully fitted out bedrooms and three bathrooms. There is also a double lock up garage (a very rare commodity on the island!). Bella Seven is on two levels - the large master bedroom with ensuite with heatpump/Air Conditioning, private spacious deck with a table and chairs, and the second bedroom with a Queen and two King Singles with heatpump/Air conditioning plus bathroom on the top level. Here you will also find the second sitting room with a wall mounted flat screen TV. Downstairs is the main living area of the home and it also has the third bedroom and full bathroom, separate laundry, dining area with seating for 10 and a wonderful state of the art kitchen complete with stainless steel Bosch appliances and everything else you would need to whip up a meal for a large group of family and friends. This flows through to the undercover outdoor dining area complete with outdoor dining suite, BBQ. Please Note: A late checkout of 12pm applies to this property. A security deposit of $500 is required for each booking. This fee is fully refundable if no damage to the property is recorded and further cleaning is not required. Check in 2pm, check out 12pm. This property is only a 7 minute walk from town. The property is beautifully maintained, with a high standard of fixtures and fittings. The property is beautifully maintained, with a high standard of fixtures and fittings. Well presented and has everything you need from outdoor seating areas to the most comfortable beds. Only a few minutes walk to Oneroa and a fabulous local taxi driver just across the road made our stay very relaxing. Fantastic property with everything you need and more.